With gluten free dishes marked on the main menu, and coeliac disease in the family, Via Fratelli understands gluten free requirements well. Choose from pizza, pasta, salads, risotto, as well as some desserts. Gluten free pizza bases are bought in, and pizzas are prepared away from the regular pizza making area, slow cooked in an oven on a separate tray, and then finished off in the wood fire oven. They are then cut on a separate board, using a separate cutter. Similarly, the gluten free pasta is bought in, and all of the pasta sauces are gluten free. The restaurant is fully licensed, with BYO bottled wine permitted. 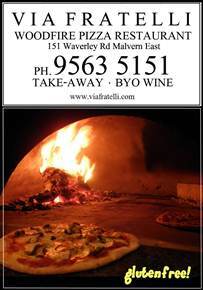 Via Fratelli is family orientated before 7pm. A pleasant, yet distinctly Italian decor creates a casual, quiet, and romantic atmosphere. Alternatively, group and functions bookings are accepted. Please contact the restaurant to discuss your requirements. Indoor, rear courtyard and street dining is available.